To the Aztecs, the cacao bean was the food of the gods. The beans are the basic ingredient of chocolate. Recent research has suggested dark chocolate offers some health benefits. Raw cacao beans are an increasingly popular alternative to chocolate. Many people believe the raw beans are better for you than processed chocolate. Cacao beans are produced by the cacao tree, a small evergreen native to tropical Mexico and Central America. The raw cacao bean has a nutty taste similar to dark chocolate, but somewhat bitter. Raw cacao beans may be eaten by themselves or added as a topping to cereal, desserts and fruit. Some people add honey as a natural sweetener because of the bitter taste. Good Cause Wellness states that the cacao nib, or peeled cacao bean, has 130 calories in a one ounce serving, of which 110 calories come from fats. There are 12 grams of fat per serving, of which 7 grams are saturated fat. 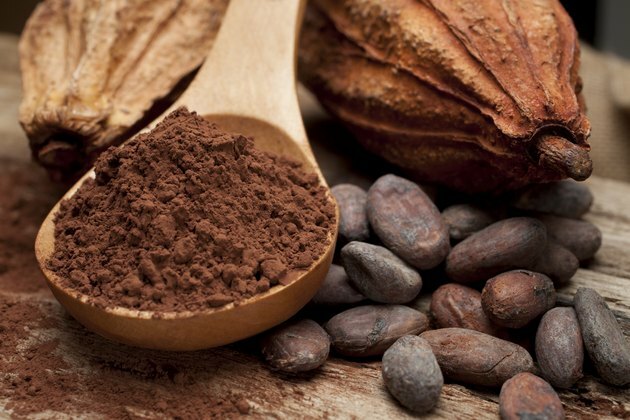 There are no trans-fats or cholesterol in raw cacao beans. Dietary fiber amounts to 9 grams and protein to 4 grams. Raw cacao beans are rich in antioxidants, which lower free radicals, which are chemicals that can alter or damage the body. According to Good Cause Wellness, the beans provide some iron and calcium, but are particularly rich in magnesium. There are 76 milligrams of magnesium per one ounce serving, or 272 milligrams per 100 grams of the beans. Scientific studies of the effects of dark chocolate indicate that it stimulates the release of endorphins in the human body. As a result, dark chocolate may have an anti-depressant effect. A study in the 2012 issue of the "International Journal of Hypertension" reports that the antioxidants in dark chocolate help to reduce high blood pressure and improve circulation. Advocates of raw cacao beans claim the beans provide these health benefits to a greater degree because the raw beans have a higher level of antioxidants than processed chocolate. Before you rush to buy a supply of raw cacao beans, keep in mind that the health benefits researchers have discovered are based on studies of dark chocolate, not the beans themselves. Much of the research, while promising, is not conclusive. What Are the Health Benefits of Unsweetened Chocolate? Does Chocolate Act As a Laxative?